The following post has been produced by using the speech to text feature on my smartphone. So full disclaimer there may be some grammatical errors and things that do not make sense but please bear with me and my smartphone! Throughout our trip we have used our Chase Ultimate Rewards points to redeem different travel experiences offered through there points redemption web portal. These points are earned via sign-up bonuses for the new credit card and by every day expenditures. Each point art is basically one penny, so with 50,000 points we have about $500 at our disposal to be used towards airfare, hotels, or travel experiences like tickets to events or Admissions and tours. Some of the experiences have been delightful, such as our Seaport Village Fourth of July VIP experience, and our food tour in Venice. Others have been disappointing because our tour guide never showed up, that happened twice in Dubrovnik, Croatia. That was a real bummer because we could have used our time more effectively to do some other touring, but instead we were waiting around for people who never showed up. Then we had to figure out what to do instead and by then it was too late to reserve something else or two take the public bus to get to somewhere. In Rome, we have a few experiences booked with the Chase Ultimate Rewards. 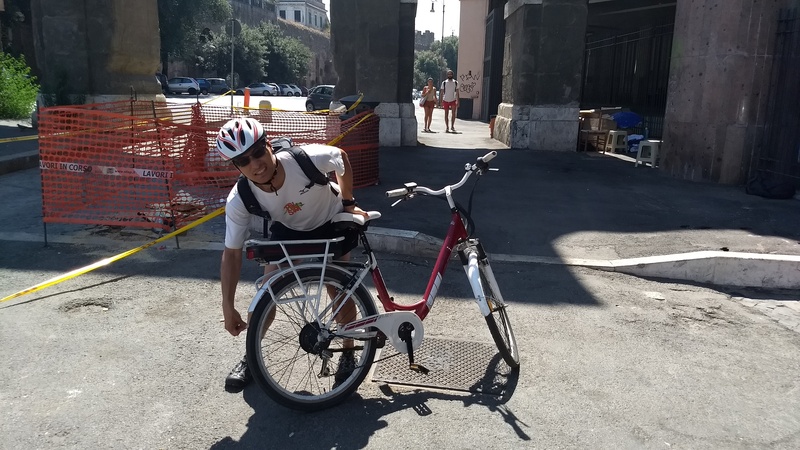 Our first one is renting electric bicycles for the day to tour some places that would be pretty cool to see by bike, specifically the Appia Antica, which was one of the original roads leading from Rome and on Sundays they close it to traffic so it is just pedestrians and bicyclists. Perfect! So I wore my white dri fit shirt, my sport shorts and my sandals because I knew I was going to do minimal walking today. 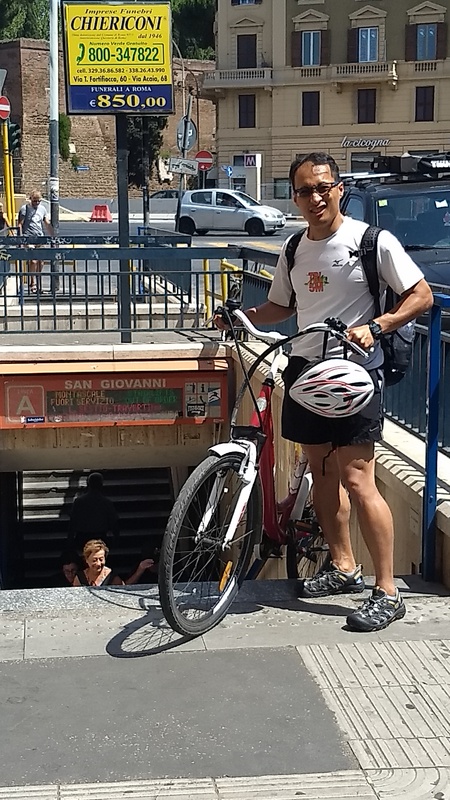 First we had to get to the bicycle rental shop, which is located at Rome’s main train terminal. However our hotel is in the Travestere neighborhood, which is over an hour walk to the bike shop. Taking the tram or bus line 2 the train station would be the best option. So using my Google Maps, I figured out where to catch the bus in order to get to our reservation on time. However, I did not realize that you must already have tickets before you board the bus or tram or Metro (subway). Yesterday when we arrived to Rome I bought tickets at the transit station and they had to get machines to do so. I thought this would be the same at every tram stop, but I was mistaken. So although we were at the correct bus stop, we did not have any tickets. You cannot buy tickets when you board the bus, you have to get them either at a ticket machine, the transit office, and or certain retailers and bars. Unfortunately, on an early Sunday at 9 a.m. there is not a whole lot open. So we walked for maybe 15 minutes before I found a juice smoothie stand and asked the guy in my best broken Italian if he sells any tickets for the bus. He did not, and he did not know where else I could go to buy them. So we continued walking on, hoping to find some place to buy these elusive bus tickets. Eventually, after crossing the bridge and walking on towards the next tram stop, I did find a little convenience store that had a sign that signified tickets were for sale. So I went in and bought our tickets, and we were able to find the correct bus for our destination. However when the bus pulled up it was quite full and standing-room-only, fortunately one of the passengers pointed me to where I needed to validate and stamp our bus tickets so I would not get the 50 Euro on-the-spot fine from any fare inspectors. The half-hour ride was bumpy and crowded, but we made it to the terminal and got off. Unfortunately we got off one stop too early and added additional time two our walk to the bike shop. It was around 10:10 a.m. when we arrived to the bike shop. There was one employee there and he found our reservation and we went through all the paperwork etc etc like the contract and liability forms. He provided us with the locks and helmet and the lunch in bottled water and then he showed us our fights and went over the features and operating procedures. I’ll take a test drive on the first bike and found out that the electric pedal-assist was not working. It was basically just a manual bike that you use human power to propel it forward. The second bike did work as advertised, although the brakes were a little loosey-goosey, front brake was fine but the back brake didn’t have much stopping power. There were probably five other bicycles so we spent the next 20 minutes trying out the other bikes, but each one had unique issues that ranged from a broken pedal, to suspect and non-working breaks, to wobbly handlebars that did not give you confidence riding in the street because you thought it would fall off. Eventually I settled on the best of the worst, a bike that had a good front brake but pretty much no back brake. The pedal assist did work and finally we left the bike shop around 10:45 a.m. to start our adventure. we rode down hill on the cobbled streets with me in the lead and Lisa trailing behind. However when we got to the bottom of the hill, we said was having some trouble keeping up and she questioned if her pedal-assist was even working. I took one look at her bike and realized that her back tire was flat. So we hiked back up that Long Hill in the sun and returned to the bicycle shop. 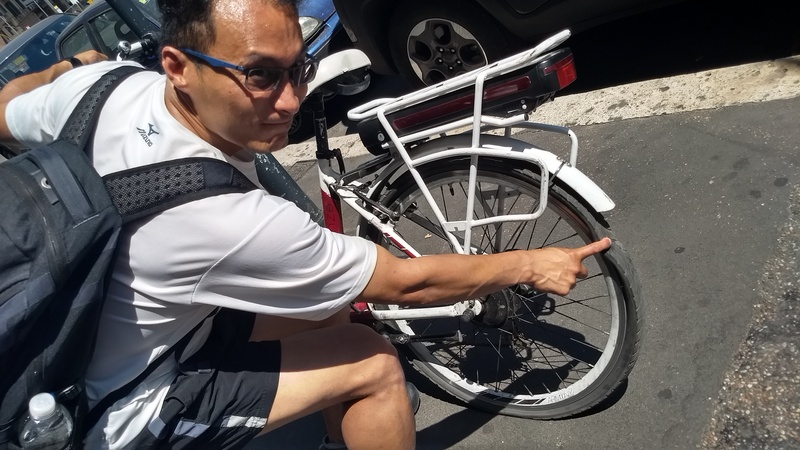 I showed him the flat tire, but was not offered an apology, he just took the bike pump and filled the back tire with air and told me to try again. I wasn’t too confident in this so I took a longer test drive around the block, purposely going over some bumps to make sure that the tire could really keep the air and it seems like it could, so I returned and said that we would try again. Time was now 11:15am. 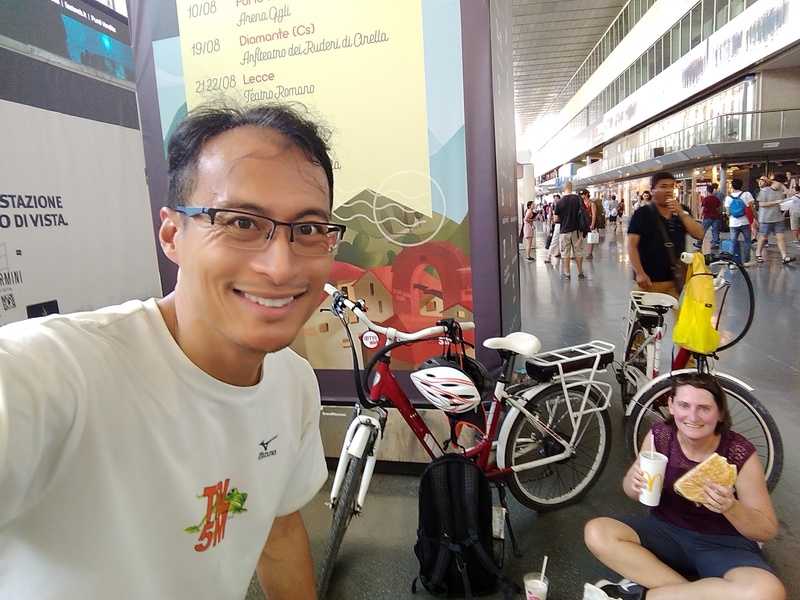 I switched electric bicycles with Lisa so I had the now fixed Flat Tire Bike and she had mine, and we started on our way through some pretty busy streets and bumpy roads on track towards our destination. Every now and then I would stop and check the back tire by using pressure with my thumb and it seemed like everything was fine. Of course everything was fine because we were still close to the bike shop! Lo and behold, two and a half miles and 30 minutes later, I felt a disturbance in the force. All of the sudden my bike was not handling well and I looked back to find that the tire was completely devoid of air. Yep, the flat tire was back. I cursed as I shook my head in disbelief, took off my bike helmet and took a few deep breaths. Man, I could not believe this happened! Although in hindsight I should have known not to take the same bike back on the road. I blame myself and I blame the Bike Shop, the heat and the distance back was not helping my mood. I checked Google Maps on my phone and luckily found a few bicycle shops within a one-mile radius. Unluckily I found out that they are not open on Sunday. The closest bike shop was a rental outfit that was a mile and a half away. My idea was to go there and borrow a bicycle pump to get some air and maybe ride back to our bike store but that was not going to happen. The only alternative left was to walk back to the bike shop, which Google Maps said would take about 45 minutes. Wait, there possibly was another alternative. The guy at the bike shop said if anything happened that we could take the metro back to the main train station in get us close enough to the bike shop. So we made our way to the closest metro station, lugging the heavy bicycles down the steps and into the underground Metro System where I checked the wall map to figure out how to get to the train station. There are multiple entries and exits wanted to be sure that I was not going the wrong direction. Nearby were some to get machines and there was a representative from the subway there. I showed him my Google Map phone to make sure I was at the right place to get the train and he pointed me in the right direction. Just to make sure, I asked him if bikes were okay to take. He looked at me, he looked at the bikes, and he shook his head no. Well, s***. That is why some passengers walking up the stairs gave us dirty looks as we were bringing our bicycles down the stairs. So we had to get back up to the street and get those heavy bikes up the stairs since the lifts were not operating. Of course they were not working, it just seemed like everything fell into place, that going to Appia Antica was not meant to be for us. And so we walked. We walked back to the bike shop, trying to fight the shade when there was a little, Crossing illegally when it was safe because it was too hot to wait for the little pedestrian man to say it was okay to go. I found a public garden with a nice table and chairs that looks like an ideal spot to drink our water and eat our sandwich, but as soon as I popped my bike up and cleared the table, the garden security guard came up and basically told us to get out. Sheesh! Eventually we made it to the train station, hot, sweaty, thirsty, and tired. I was not intending to walk all of this time through busy streets and in the hot sun. Passing through the train terminal I spotted a McDonald’s and just wanted to treat myself to a milkshake. So I braved the crowd and got my milkshake and and iced tea for Lisa. And thus we had a picnic lunch on the floor of the train station, but ended up only eating not even half of one of these sandwiches because it was so dry and basically just a big piece of bread with a little cheese and some ham and nothing else in it. We made it back to the bicycle shop at 1 p.m. I told him that the bike got flat again and that he should not rent out the bike. I was still open to getting a replacement bicycle and going to a different destination, a huge part that a lot of people go to to ride bicycles, Segways, and those four seater bicycle carts. Since we had already paid for this, I was willing to give it one more shot. Pictures I had to find another electric bike that would suit me. I tried two other bikes and the breaks basically did not work at all. He said that I needed to squeeze both brakes at the same time in order to stop, but even going at a low rate of speed their combined stopping power was minimal. Lisa was at this point not confident at all in our bicycles and she wanted out. Who could blame her? We had just wasted about 4 hours of our morning trying to get to this bicycle shop and having all these problems that it just wasn’t worth it anymore. The bike shop dude try to explain that in foreign countries you cannot always expect the brakes to work perfect. Okay, I guess. But I would rather be safe than sorry and so with that last statement I told him that we were finished. I turned in our locks and helmet and signed off on the rental return which he stamped at 1:05 pm. Never once did he apologize for our mishaps and I kept it cool and didn’t complain or make any snide remarks or show any bitterness or anger. It was all a matter of fact that these electric bikes were in poor mechanical condition and we just won’t take a chance on them anymore. 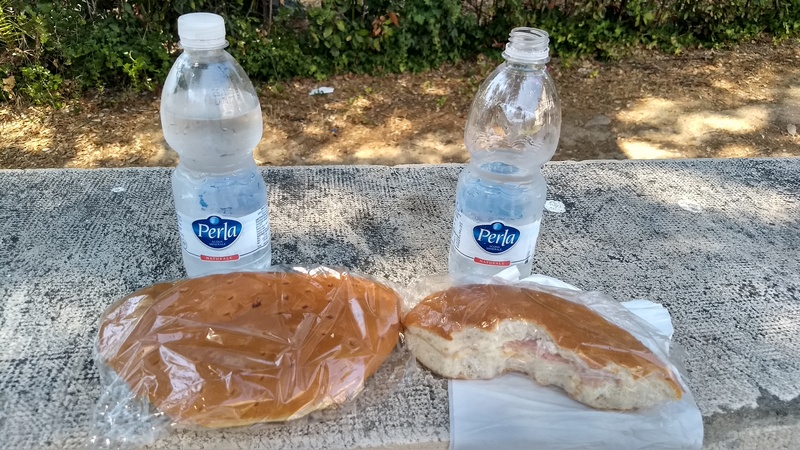 So that is the story on how we paid $84 for these lovely two sandwiches and two bottles of water Plus 4 hours of wasted time. But I suppose it makes for a memorable story at our expense. But at least we are not hurt from any bicycle mishaps and we eventually found a public drinking fountain to quench our thirst from our empty water bottles and now we are here at the zoos entrance just chilling out in the shade with an occasional Breeze to cool us down. We were scheduled to take the red-eye Delta flight to JFK on Monday, July 3rd leaving at 12:55am. With a connecting flight in Minneapolis, we were scheduled to arrive at JFK around 9:30am on that Monday. I booked this flight using Delta miles, and it was back in November — just about nine months ahead! However, with that long amount of time, schedules were bound to be changed. And they were. The original flight from PDX – MSP was no longer leaving at 12:55am. It was now leaving at 6:55am. This new arrival in Minneapolis rendered our connecting flight to JFK impossible because it would have already left by the time we landed. The new flight schedule said we’d now arrive at JFK on the evening of Monday, July 3rd, which basically changed a day in New York City into a day on the airplane. The was some hope: the alert stated that I could change the flight once at no charge and all I had to do was call the reservation line. I checked my different options, and hoped for the best … I wasn’t expected much, since our flights had been booked with miles and I figured that we’d get some pretty crappy flight choices. I am thrilled to report however that the reservation agent accepted my first request, a nonstop flight from PDX – JFK on Delta. While we will not arrive mid-morning to spend most of the day in New York, we will now arrive before 4:00pm and will actually get to sleep a little bit the Sunday night before and we’ll have a flight that won’t force us to get off and get onto another plane. The best part is that there really was no change fee and our miles were accepted for the new flight. So ultimately, this travel troubleshooting worked out okay and it is just a nice reminder to check your confirmed flight reservations every now and then, especially if you are booked way out in advance. I never received an email or call about my flight change, so had I not checked until a few days before our original departure, I probably would have not been able to book the alternative flight. Fortunately this travel troubleshooting effort led to a happy ending…even though I just received another change to our flight. But this was in minor — the plane is now leaving thirty minutes earlier, so no big deal.